Note for the cook: You can use a 6-cup or half of a 12-cup muffin pan. This recipe makes 6 muffins. Preheat your oven to 425 degrees and spray or grease 6 cups in a regular sized muffin pan. Place about 3 to 4 tater tots into each cup and bake for about 20 minutes or until crispy. Remove muffin pan from the oven and sprinkle on the shredded mozzarella cheese over the tater tots. Then, evenly sprinkle on the diced tomatoes and lay a few spinach leaves and the deli meat pieces into each muffin cup. Gently press down ingredients if needed. When you crack your egg, you don’t want the egg to spill over. 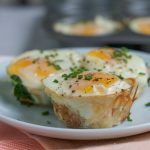 Crack an egg over each muffin cup, on top the deli meat, keeping the egg in the muffin cup. Season with salt and pepper and bake for about 20 minutes, or until the eggs have set. Do not over bake the eggs. Remove from the oven and let the muffins cool in the pan for about 5 minutes before removing from the muffin pan. Garnish with the fresh, diced chives and serve immediately.